Wat is dit voor site? Wij zoeken de goedkoopste boeken op internet. Federal Judicial Vacanciesvonden we het goedkoopst op Bol.com voor €112.00. We hebben gezocht in nieuwe en tweedehands boeken. Rechtsonderaan de pagina kan je het boek direct bestellen	via Bol	.com. During the 111th Congress, lower court nominations and vacancies in the federal courts frequently were a subject of partisan debate. The Senate appeared divided along party lines over the degree of urgency to assign to rising judicial vacancy rates. Democrats stressed the need to fill vacant judgeships as promptly as possible, while Republicans emphasised the importance of deliberately reviewing the qualifications of judicial nominees before voting on whether to confirm. An assertion of some Senate Democrats, one which Senate Republicans declined to make, was that the number or level of judicial vacancies was historically high. In order to provide Congress with a fuller context for further discussion of judicial vacancies, this book examines the vacancy rates that existed in the U.S. district and circuit courts during the 111th Congress relative to earlier time periods. 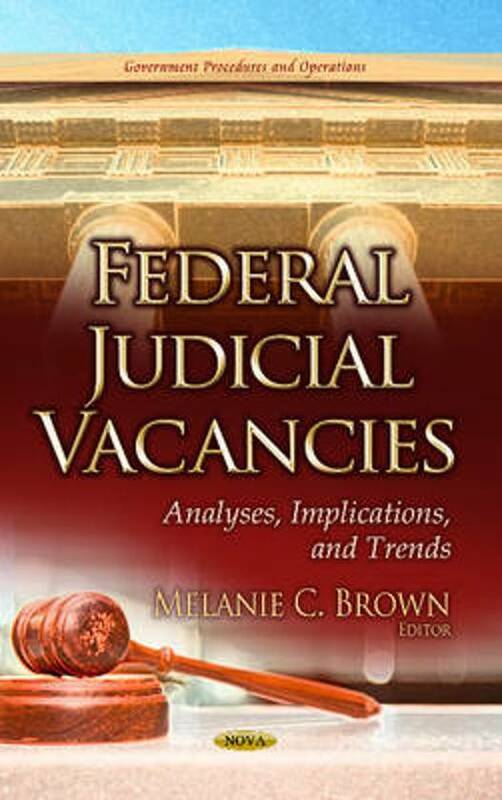 This book provides an overview and analysis of fluctuations that have occurred in daily judicial vacancy rates from 1 January 1977 through January 2011. For this 34-year period, the book identifies when judicial vacancy rates reached relatively high levels, the apparent causes of these rate increases, and how quickly the rates were reduced.